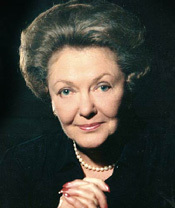 Helen K. Copley moved from Cedar Rapids, MI to San Diego in 1951. In 1953 she began work at the Union Tribune where she met her future husband James S. Copley. They were married in 1965. Jim Copley was the Chief Executive Officer of the Union Tribune from 1947 until his death in 1973. Mrs. Copley then took her husband's place as publisher and put the business onto a strong economic path. Literacy has always been one of her main causes. She founded The James S. Copley Library in La Jolla in 1966, chaired a multi-million capital campaign for improvement to the UC San Diego campus library, launched the San Diego Council on Literacy in 1986, and provided the necessary funds to build our library here at The Preuss School UCSD.